Chicago, IL - Parishioners and friends of Holy Resurrection Serbian Orthodox Cathedral in Chicago gathered to celebrate the Cathedral’s annual Slava on Sunday, April 11th, 2010. The annual Cathedral Slava is traditionally celebrated on the first Sunday following PASCHA, also called St. Thomas' Sunday.The joyous celebration started with the Divine Liturgy celebrated by our Cathedral Clergy in the presence of His Eminence Metropolitan CHRISTOPHER of Libertyville-Chicago, with the responses sung by the Cathedral Choir, the S.S.S. Branko Radichevich. 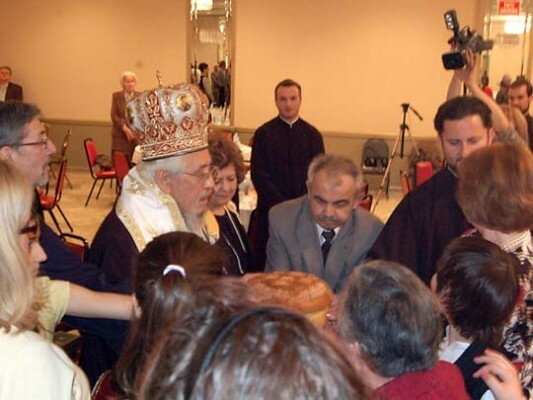 Following the Divine Liturgy, His Eminence led the rite of the blessing of the Slava Kolać. Gathered around His Eminence were the Cathedral Clergy, Executive Board members, representatives of the affiliated organizations, and the Cathedral Children. At the request of His Eminence, the children were in the forefront when turning of the festal kolać. After all they are the future leaders of our Parish. Under director Elizabeth Neskow, the S.S.S. Branko Radichevich sang beautifully during this ceremony. A delectable Festal banquet with traditional Serbian Slava fare was lovingly prepared by our Circle of Serbian sisters, Željko Karanović, and Milutin Đorđević. The capable and enthusiastic waitstaff was comprised of members of the youth group. We thank all those that generously donated their time and talent to ensure the success of our Slava celebration, and especially to Dušanka Jakšić who did a fantastic job as Chairperson of the event. Deacon Damjan Božić lent his natural talents and skillfully served as the Master of Ceremonies for the Slava program. Greeting all of the parishioners who attended the joyous celebration were Fr. Darko Spasojević, Cathedral Dean, Biljana Šević, President of the Church Executive Board, Mira Đorđević, Kolo President, Jelena Stojaković, President of S.S.S. Branko Radichevich, and Marko Bojović, Principal of the St. Sava Academy. Mrs. Šević took this opportunity to introduce and acknowledge all the Executive Board members for their contribution and efforts. In his greeting, His Eminence Metropolitan CHRISTOPHER recognized that the greater majority of the Cathedral Executive Board is comprised of women, and took this opportunity to eloquently speak about the significance of the Serbian woman, her various roles in the life of the community, and the impact that she has made to the Serbian community on the North American continent. He alluded many times to the Serbian woman’s strength, conviction and faith comparing her many times to the myrrh-bearing women who spread the news of Christ’s Resurrection after coming to His tomb and finding it empty. The cultural program was opened by the angelic voices of the Jr. Brankies singing Hristos Voskrese and Ljudi Likujte, under the direction of Popadija Jelena Vranić. The SOKO Folklore Group followed and entertained us with dances from various regions of Serbia. The highlight of the day was the littlest members of the SOKO group who performed with pride and large smiles. The glee on their faces was unforgettable, missteps and all.